Embark on a dream Catamaran cruise and experience sailing at its best! Spend a memorable day onboard one of the catamarans that form part of our fleet around the beautiful island of Mauritius. The catamarans that form part of our fleet are all day Cruisers designed specifically for day sailing excursions are based in the South East Coast at Preskil beach Resort, on the North Coast at Grand Bay and on the West Coast in black river. You are eager to know what it`s like to stay underwater with a tank on your back and have a regulator in your mouth with air flowing in on demand. So to learn more of our introductory dives join our discover scuba diving program. This is a half-day program, where an instructor teaches you the basic theory with a proper briefing of the course conduct, practice in the pool and then takes you out for a proper dive, to give you a taste of diving and a chance to participate in the underwater world. It's safe, it's easy and it's a lot of fun! With three pool sessions and three academics from our open water manual and also with a view in our open water DVD and of course two sea dives you will get your certification after completing the three quizzes. After this step defitively you will have more interest to know more in diving, so don't lose time join our Open Water Course. This consists of an academic component, where you learn more about the fascinating underwater world, followed by five confined water sessions where you master essential skills of scuba and then four open water dives. This tour will introduce you to the southwest region of Mauritius. You start by Cure pipe at Factory Shop Tax free! To shop: fabric and luxurious clothing (cotton, silk or cashmere), jewelry, watches and diamonds at Adamas and Cledor tax free, fantastic ship models and local quality craftsmanship. A few minutes are the old crater of Trou aux Cerf’s, offering 360 degree views of the island. Then drive you to the high Central plateaus, through the sacred lake, 'Grand Basin a lake in the crater of the extinct volcano. This lake is a sacred place for Hindus followers. You will be surprised and happy to participate in the traditional ritual in a temple. You then continue to 'Black River Gorges, known to be one of the last havens of peace and Superior view of the mountains and endemic bird species. And lunch at Restaurant Chamarel where there is variety of special menus typically Mauritian. Your route takes you then chamarel a village almost forgotten time you visit two extraordinary sites in this region: Chamarel waterfall, 90m high, and the land of 7 colors. We offer a wonderful adventure attraction in a site that is one of its kind in Mauritius - adventure in the treetops! A unique activity in an adventure park located in the heart of the tropical forest in Mauritius. Nepalese bridges, knotted-ropes and lifelines make this trip much more fun than a classic trip. It is a special adventure along footbridges and through the treetops. In the park there are two tracks that fit all levels. These tracks of differing difficulty can be done one after another or with some break between them. The Orca Dive Club Mauritius in Merville is open all year round. Every day from 8am until 6pm, you will therefore always find a friendly face to answer all your questions. The extended opening hours also allow you the flexibility to get the most out of your diving holiday as check-in/out can be arranged to suit you. We also offer night dives. It gets dark in Mauritius between 6pm and 7pm, depending on the season. Do you want to live a thrilling adventure? 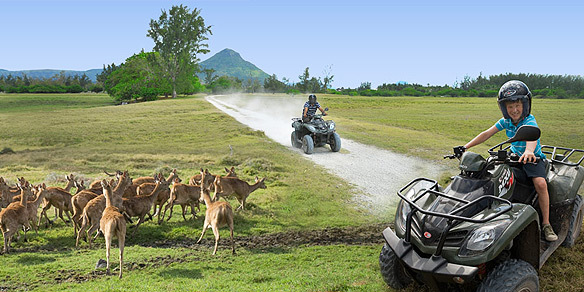 Then no other way than quad biking can give you that feeling of perfect harmony with nature. Discover the Wolmar nature reserve, across the rivers and forests, the home to herds of Java deer. Our guide will take you to the remotest areas of the park, for an unforgettable experience.